Ssangyong shows SUV concept | What Car? This is the Ssangyong SIV-1 concept car that has been unveiled at the Geneva motor show. 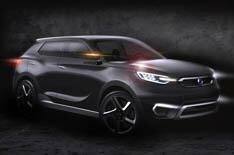 The concept car is part of a design programme that will lead to a new SUV that Ssangyong is expected to release within 18 months. It is the latest in a succession of SUV-based concept cars from the company. Ssanyong has previously shown the e-XIV, a three-door range-extender at the Paris motor show in 2012, and the XIV-1, a supermini-sized SUV, which was unveiled at the Frankfurt show in 2011. Ssangyong's SIV-1 is a Skoda Yeti-sized concept car and features a mobile audio system, four individual seats and a bold, contemporary design. The SIV-1 will be among a range of SUVs making their debut at the Geneva motor show. Subaru has already confirmed it will reveal the Viziv, while Suzuki has also confirmed it will unveil a new crossover.